Are people suffering as a result of ultrasound in the air? New research from the University of Southampton indicates that the public are being exposed, without their knowledge, to airborne ultrasound. The study found increasing exposure to ultrasound in locations such as railway stations, museums, libraries, schools and sports stadiums, in which there have been complaints of nausea, dizziness, migraine, fatigue and tinnitus. Ultrasound in public places can be generated from a number of sources including loudspeakers, door sensors and public address systems. For a number of years, workers who have been regularly exposed to occupational ultrasound through industrial devices for cleaning and drilling have reported similar negative effects. While there has been insufficient research to confirm or deny a link, the study author Professor Tim Leighton says that current guidelines and research knowledge for occupational safe levels are inadequate to cope with the current mass exposure of large numbers of people. Professor Leighton, from the University’s Institute of Sound and Vibration Research, said: “Existing guidelines are insufficient for such large public exposures as the vast majority refer to occupational exposure, where workers are aware of the exposure, can be monitored and can wear protection. Furthermore, the guidelines are based on the average response of small group, often of adult males. 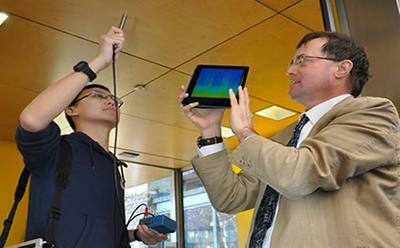 Using smart phones and tablets equipped with an app that produced a spectrogram of the microphone reading, Professor Leighton collected readings of very high frequency/ultrasonic fields (VHF/US) fields in a number of public buildings, at a time when they were occupied by hundreds of people. The findings were then calibrated with two or three independent microphone and audio data systems. Professor Leighton found that members of the public were exposed to VHF/US levels over 20 kHz, which is the threshold of the current guidelines. He is now calling for further research and the production of a new set of guidelines based on this research. “Individuals who are unlikely to be aware of such exposures are complaining, for themselves and their children, of a number of negative conditions. Recent data suggests that one in 20 people aged 40-49 years have hearing thresholds that are at least 20 decibels (dB) more sensitive at 20 kHZ than that of the average 30-39 year old. Moreover, five per cent of the 5 to 19 year age group is reported to have a 20 kHz threshold that is 60 dB more sensitive than the median for the 30-39 year age group,” he said. No new guidelines must be based primarily on selection of levels quoted in older guidelines. Guidelines for occupational exposure must not be applied to public or residential exposure, and recognition must be given to exposure of long-term ‘guests’ (in schools, hospitals, prisons, public transport for example). Studies and new guidelines must take account of the deviation from the average of individuals within a population, and within particular demographic subsets within the population. Research is required to ensure that guidelines properly account for the selection of those adverse effects that should be minimised or prevented. Research must be undertaken to assess whether current audiological practices, equipment and standards are suitable for the VHF and ultrasonic regimes, and identify measures to rectify any shortcomings. A current survey of modern devices and their source levels (using international standard procedures and calibrations traceable back to primary standards) should be undertaken. A full list of the guidelines and research recommendations can be found in the study, which is published in the journal Proceedings of the Royal Society A.